The solid wood base of the Amish Plum Creek Double Pedestal Table resembles the petals of a flower, making for a very inviting place to gather at mealtime. This solid wood dining table offers a little more leg room with its pedestal base, and the impressive columns show off the richness of the solid wood. This is a dining table that will not have to be replaced, but instead will be passed on to someone in the family one day. At DutchCrafters, we're so proud of our Amish made dining tables. We've gone to the wood shops to see how they are built and the process reinforces the quality you are getting. Every table is made by hand and there are no shortcuts. 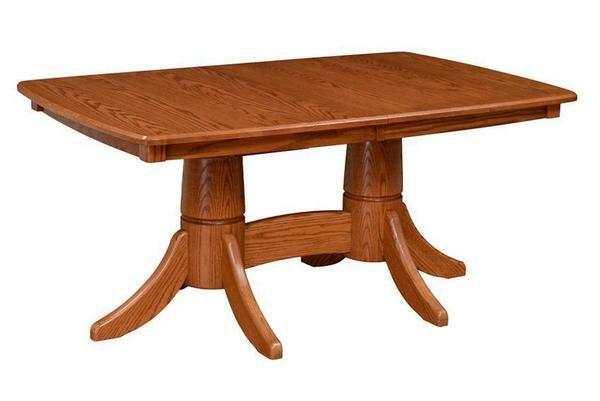 The Amish Plum Creek Double Pedestal Table is shown here in oak wood. We're happy to assist you as you design the look for your new table. Click on options or please contact us for assistance. Our Furniture Specialists are happy to share their knowledge of wood types, finish colors and features. Thank you for shopping with DutchCrafters, the #1 online retailer for Amish made furniture.